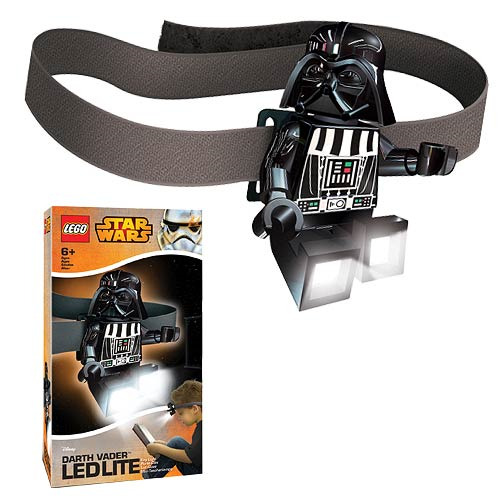 Conquer darkness in all directions with the LEGO Star Wars Darth Vader Head Lamp Flashlight! Construct your LEGOs with the help of this awesome adjustable head lamp. Mini-figure features posable arms and light angling legs. Conquer the darkness in any direction with the LEGO Star Wars Darth Vader Head Lamp Flashlight! The light is operated via switch. Each head lamp flashlight includes a Velcro adjustable headband and a 2 3/4-inches tall Darth Vader mini-figure. The Darth Vader mini-figure has a clip on his back so he can attach to the headband, a backpack, clothes, and other items, so you'll never run out of fun ways to use the guy. With posable arms and light angling legs, the LEGO mini-figure makes a cool stand-alone piece, too! For extra comfort the headband features a padded head buckle with unique detail of the Galactic Empire symbol. "You are unwise to lower your defenses!" And you're more unwise if you miss out on this LEGO Star Wars Darth Vader Head Lamp Flashlight. Note: Figure not compatible with LEGO sets. Requires 2 x "CRO25" batteries (included). Ages 5 and up.